While Rear Setting Curtains may not be the main attraction… they are definitely what completes the ambiance. These curtains subtly cover or divide features to focus the audience’s attention on what is most important. A Border is the same type of curtain as the Grand Valance, just further upstage. They form the top part of the visual frame. There is typically one Border for each set of Legs, one for each Draw Curtain, and one for the Scrim / Cyc position. The purpose of the Border is to hide the battens and tracks the other curtains hang from, to mask the Electrics (lighting fixtures), and to prevent the audience from being able to see up into the fly space or ceiling. This helps reduce distractions and keeps the audience’s focus on the action. Borders should be trimmed so that when seated in the front row, all elements are appropriately masked and the bottom of each border hangs low enough you cannot see the top of the one upstage of it. Legs are the counterpart to Borders. They form the sides of the visual frame and make wings (the offstage hidden areas). They also mask any side lighting if it exists. Wings provide an unseen area for actors and scenery to wait before going onstage. Each leg should be set so it masks the necessary elements, and, to audience members seated at either extreme side of the audience, the onstage edge of each leg fully covers the offstage edge of the one behind it. Visually, there should be a few feet of overlap so if a leg gets bumped by an actor or scenery the audience does not see into the wings. Tabs are similar to Legs but run upstage/downstage rather than stage left/ stage right. They fit either between the legs or just offstage of them. Their purpose is to help mask the wing area if leg spacing and sizes are not adequate. Many stages do not have or need them, but in some venues legs have to be too narrow because of lack of wing space or spaced too far apart to allow scenery to pass. In these cases Tabs can be the answer. They are also helpful for blocking light spills from prop tables, fly rails, and backstage safety lighting. If your show requires really black blackouts, Tabs may be necessary. 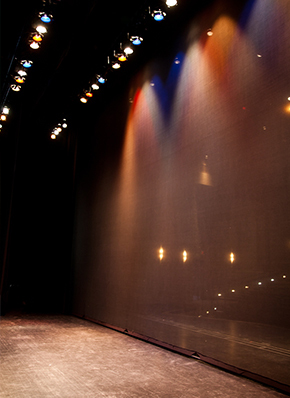 Intermediate Draw Curtains, like the Grand Drape, cover the entire stage. A Draw style curtain is really two curtains that work as a unit; one half covers the Stage Right side of the stage and the other the Stage Left half. They run on a track and work similarly to a regular bi-parting window curtain, only on a really big scale. When a Draw Curtain is open it can function as a set of legs. When it is closed it divides the stage in half allowing for a visually shallower stage and provides room to make scene changes behind it without stopping the onstage action. An Intermediate Draw in roughly the middle of the stage is referred to as a Mid-Stage Draw, while one all the way upstage is referred to as a Rear Draw. Rear Draws are primarily used to cover the cyc, for times when a dark background is needed. Draws close in from each side so they look similar to legs when they are in their open position. This is useful because a set of legs can be eliminated if a Mid Draw and/or Rear Draw is used. A Scrim is a flat seamless drape, typically made from either black or white Sharkstooth Scrim. The magic of Sharkstooth Scrim is that it can be made to look completely opaque, translucent, or completely transparent depending on how it is lit. This is very useful for making things appear and disappear or to give a dream-like quality to the stage action. They are also useful for hanging in front of a Cyc to give it a more even or muted appearance. In order for a scrim to work properly, it must be smooth and flat and cannot have any visible seams. Sharkstooth Scrim comes in very wide widths. The width of the fabric becomes the height of the curtain and can be up to 30’ tall. To keep the curtain stretched flat a reinforced pipe pocket is provided to weight the bottom, and reinforced grommets can be provided down the sides to prevent the sides from “hour glassing”, if requested. Cyc, short for Cyclorama, is a curtain used as a background. It is typically white but can be grey, sky blue or another specialty color. When lit, it can be made to change color or give the illusion of a sky. For TV and video production, Cycs can be Green, Blue, or Orange (red) for keying. The Cyc is typically flat and seamless but occasionally is seamed and may have fullness. For the best lighting effects, seamless white Filled Leno is recommend but can be beyond many budgets. Seamless white, or even natural, muslin also works well and costs less then Leno. If there is no dedicated Cyc lighting, then we recommend a sky blue Poly Cyc material. It is an IFR product, but is not available in extra wide widths so seams are often necessary. If no Cyc lighting exists at all, we recommend using the Poly Cyc material and adding 50% fullness. This will give an attractive background that does not look as dead as other fabrics when not lit.